One of the joys of my job as executive director of the Council of Administrators of Special Education, is to be able to work alongside some pretty amazing professionals! This past week has been filled with just that kind of interaction! As you read this article, the CEC/CASE Legislative Summit is in session! This collaborative event is the result of some amazing visions and effort on the part of your colleagues at CEC and CASE! I am truly sorry the majority of you are missing out on this event. I have mostly talked about the Legislative Summit but it is actually a combined event of six separate meetings historically held by CEC and CASE spread throughout the summer months — CAN (CEC Policy Children's Action Network) in June; CASE Legislative Summit in July, CEC Leadership meeting for State/Provincial units and following that meeting a leadership meeting for Divisions which also included an IDC (Inter Division Caucus) meeting, and the PAC (CEC Program Advisory Committee) which typically meets right after the Leadership meetings, all in late July. So all those meetings are being condensed and held over the period of 6 days! By holding these meetings over the same timeframe, there is a great opportunity for more people to make a stronger impact up on the Hill. This is the first year but watch and see how you, your unit, and your division can all become an integral part in this amazing opportunity! I still remember the very first CEC leadership meeting I went to back in the days when the CEC office was in Reston. I was so amazed at how much I learned that could benefit my home chapter, my state unit, and my division. Some of the Leadership sessions will be recorded and I believe this will be a resource many of our unit and division leaders will be able to use in the year to come! But, start saving your pennies now so you can be an in person participant next year! We need to really make an impact and at the same time there is so much we can learn from each other! We have a great staff at CEC and they exist to assist all of us as we serve all students! And as I said last week, even if you are not in DC with us, you still need to schedule time to interact with your legislative delegations during this summer and upcoming school year! What happens in the classroom IS too important to stay in the classroom! And speaking of amazing partner opportunities this past week... I had a unique opportunity to co present a webinar on Leading by Convening: Authentic Engagement with Drs. Patrice Linehan(IDEA Partnership/NASDSE) and Anne Louise Thompson (National Center for Systemic Improvement (NCSI) )for the Technical Assistance Coordination Center (TACC). There were over 100 people on the line for the 1 hour introduction to this amazing tool for true stakeholder engagement. To go to the recorded webinar, click here. We all think we are collaborating but when we really objectively look at what we are doing, we are so often just slapping on a new coat of paint on a very old model of interacting! For more on Leading by Convening, go to www.ideapartnership.org. Another example of amazing partners... Hopefully by now you know the early bird registration for the CASE 26th Annual Fall conference: Continuing to Take Care of Business is open on the CASE homepage! This event is also another example of working with amazing partners. The very "theme" itself is a collaboration. How many times have you wondered how your state conference compares to other state conferences? How often have you wanted to learn something new to add to your state conference? But who gets the opportunity to attend another CASE unit's conference. This you year can have that opportunity! Georgia CASE will be having their state conference right before the CASE conference. Their theme is "Taking Care of Business!" — see the collaboration? The GCASE closing event will be the CASE opening luncheon. Right now during the early bird, you can register to attend BOTH the GCASE conference and the CASE conference for only $450! Just think what you will be getting! And as a hometown Atlantan — born inside the Perimeter — let me assure you, Atlanta is a great city to spend a few extra days! The registration for the conference will never be lower than it is from July 1- Aug. 1! Watch for more details as the date get closer but don't wait too long to get this great price on the Early Bird registration and to get your hotel room at the Atlanta Hyatt Regency! Click here to reserve your hotel room and remember to use the code "case." Want to further your own leadership skills? When you make plans for everyone else, don't forget YOU need to continue to grow. Did you know CASE has a Leadership series? When completed we will have 7 books in the series, but right now we have 3: The Journey to Effective Leadership: Book 1: CASE Leadership Series for Special Education Administrators (Chambers); Trends and Issues Affecting Education and the Provision of Special Education Services: Book 2: CASE Leadership Series for Special Education Administrators ( Bogdan); and Organizational Change: Transformative Leadership for Special Education: Book 3: CASE Leadership Series for Special Education Administrators (Kukic and Rude). Check them out on our website and order yours today! 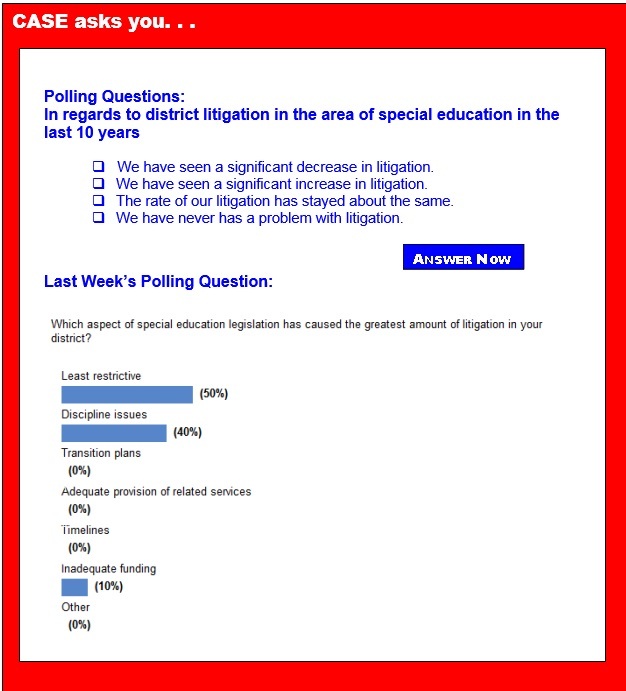 Last Week's Poll asked, "Which aspect of special education legislation has caused the greatest amount of litigation in your district?" Of those answering this week's poll, first place at 50 percent for the greatest amount of litigation was due to least restrictive environment. Second place at 40 percent was due to discipline. The other area that seemed to cause litigation was inadequate funding at 10 percent. I decided to ask a follow up question this week. I hope many of you will answer it! ESEA is on the move! The long awaited action as ESEA heads to the Senate floor to be reauthorized. The debate started on the Every Child Act of 2015 (S.1177) with opening remarks from the bill's co-authors, Senators Lamar Alexandria, R-Tenn., and Patty Murray, D-Wash. Coming to the floor with a unanimous bi-partisan vote from the HELP Committee, the bill brings significant momentum toward achieving passage. The Children's Budget 2015 compiled by First Focus details federal funding for children. It is a great resource for those seeking to improve the lives of America's youth. More than 200 distinct investments in children are made by the federal government. Investments include traditional children's initiatives such as education and prevention of child abuse and neglect. Others include Medicaid and the Supplemental Nutrition Assistance Program (formerly Food Stamps). If your child will soon have a new Individualized Education Program, you have to ensure it meets all his educational needs. Ideally, to develop a high-quality IEP, you'll work with the school's IEP team members. But what if you disagree with them? What if you believe they're just trying to save money and don't care about your child? If you're like some parents, you may erupt with rage. But no matter how justified you feel about your anger, you need to focus on being effective, not angry. Nineteen states earned a "meets requirement" rating from the U.S. Department of Education's office of special education programs for the 2013-2014 school year, according the department's latest report, which reflects the second year of a new, tougher evaluation system. That was up from 15 states that earned that rating from the U.S. Department of Education last year, the first year the department evaluated states under a new "results-driven accountability" matrix. The states were evaluated last year on 2012-2013 data. The system was designed to measure states on special education student performance as well as compliance issues, such as whether states meet various deadlines mandated under the Individuals with Disabilities Education Act. On July 7, the Senate is expected to debate a bill to reauthorize the Elementary and Secondary Education Act, arguably the single most impactful federal legislation focused on targeting resources to students with the greatest needs. While this law is in dire need of an update, as currently written, the Every Child Achieves Act would extend states so much flexibility in determining which schools receiving Title I funds are meeting state standards that few, if any, schools will ever be held accountable for the academic outcomes of all students. After weeks of letting it languish in the legislative queue, the U.S. Senate is slated to begin debating a proposed bipartisan overhaul of the Elementary and Secondary Education Act — the first such Senate debate since 2001, when Congress last updated the law in its current iteration, the No Child Left Behind Act. Notably, the announcement by Majority Leader Mitch McConnell, R-Ky., that he would call the bill to the floor July 7 came just one day after 10 major education groups, including the two national teachers' unions and the Council of Chief State School Officers, banded together amid mounting frustrations and demanded the Senate make the reauthorization a priority. It's a common misconception that people who struggle with dyslexia also struggle with creative endeavors. Yes, many creative projects are tied to reading, writing and language skills — which dyslexics do struggle with — but not all forms of creativity stem from this particular skillset. One of the greatest forms of creativity, "making" with your hands, has evolved from traditional arts, like painting, sculpting and building, to technology-enhanced creation, like 3-D printing. As more dyslexic people are taking control of their educational journey by playing up their strengths and steering away from a heavy focus on language, technological enhancements allow their creative opportunities to expand. New research suggests that an otherwise rare speech disorder may affect nearly two-thirds of kids with autism, a finding that's prompting calls for greater screening. The condition called apraxia is estimated to affect just one or two out of every 1,000 children, but a study finds that 64 percent of children with autism may also have the speech disorder. "Children with apraxia have difficulty coordinating the use of their tongue, lips, mouth and jaw to accurately produce speech sounds, so that each time they say the same word, it comes out differently, and even their parents have difficulty understanding them," said Cheryl Tierney, an associate professor of pediatrics at the Penn State College of Medicine, who led the study in the Journal of Developmental & Behavioral Pediatrics. Why does special education have to be special? Thanks to the federal Individuals with Disabilities Act passed in 1975, students who have some kind of identifiable disability that gets in the way of keeping up with their able peers, get service from special education teachers in schools throughout the United States. While practices vary from state to state, there is some similarity as to how these services are provided. Any way you look at it, the end of high school is an emotional time: there's the elation of graduation, the bittersweet goodbyes to teachers and peers, and the creeping apprehension of closing the door on a familiar life and stepping into a new phase. For the 6 million U.S. students diagnosed with disabilities, the transition out of high school can be a nerve-wracking and challenging experience. It's what some educators and advocates call "falling off the cliff" — when students, at age 22 or when they finish high school, lose entitlement to the special education services and support systems that have kept them afloat. A growing number of teens and young adults are being prescribed powerful antipsychotics, even though the medications aren't approved to treat two disorders — ADHD and depression — they are commonly used for, a new study shows. Researchers found that antipsychotic use rose among children aged 13 and older — from 1.1 percent in 2006 to nearly 1.2 percent in 2010. And among young adults — people aged 19 to 24 — antipsychotic use increased from 0.69 percent in 2006 to 0.84 percent in 2010. Guinea pigs do not judge. They do not bully. They are characteristically amiable, social and oh-so-tactile. They tuck comfortably into child-size laps and err on the side of the seriously cute. When playing with guinea pigs at school, children with autism spectrum disorders are more eager to attend, display more interactive social behavior and become less anxious, according to a series of studies, published in Developmental Psychobiology.